You can build your own search engine and earn money like Google. For a more advanced type of search engine and for those who cannot configure the Google API themselves, there are other alternatives. You can build a dedicated search engine for keywords you have optimized and earn money. You will not earn as much as Google of course, but you can generate good traffic and make thousands of dollars per month from a well promoted sites. Since search engines do not require too much work once they are put up, you can put up several of them. Build your own search engine. Click on the link to find out about how to make your own search engine. 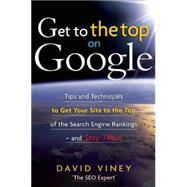 From one of the United Kingdom’s leading search engine optimization (S.E.O) experts who has worked with major companies like Amazon.com, this book is touted as one of the most comprehensive, accessible and up-to-date guides to S.E.O available. Written in a readable style for the beginner, but at the same time comprehensive enough for the skilled marketer, Get to the Top on Google will show businesses, both large and small, how to improve their search engine rankings, thereby increasing leads and sales. Thinking of search engine optimization is like cooking a meal. Keywords and key phrases are your ingredients. Discovering phrases that pay is all about finding the right key phrases for your business, then deploying the for best effect in your site and campaign. Courting the crawl explains how to help Google find your pages and index all of them appropriately, through building the right technical foundations and structure for your new or existing website. Priming Your Pages covers the S.E.O art of page copy-writing and includes deploying your phrases that pay through your site and manipulating Google search engine results pages. By landing the links in a well-managed link-building campaign you can go from an also-ran to world champion by establishing both the importance and relevance of your site. I admit; I fell for it once – almost twice. You have seen the ads, "Submit your site to 200+ Search Engines… 1000+ Search Engines… "
The second time, submitting my site to all those great search engines was for free and attached to a website that I was visiting. Since it was absolutely free, what was there to lose? Soon after automatically submitting my site into the very cool automated submitter-bot, the emails began pouring in asking me to check a box accepting that my site was to be listed by some search engine I had never heard of (…and I am the author of a search engine directory), but explaining that I would need to opt-in to receive some newsletter (better described as a ‘spamletter’). Otherwise my site would not be listed. I had never even heard of a single one of these search engines before in my life and I am reasonably sure that nobody else has ever heard of any of them either. … I get it… so they are spammers pretending to be some kind of search engine. But we know that everyone really uses Google or Yahoo… so we can ignore these phony so-called search engines. Experimentation is a good thing on the web. Try a few things, see if they work. Repeat the things that work, stop doing the things that do not. Thanks to habits like this, you quickly learn the things that work and the things that are a huge waste of your time and virtually guarantee you a healthy serving of future aggravation. Search Engine submitting services are one of the latter. How many Search Engines can you even name? Can you even name 10 search engines without looking at a listing? Submitting your website to all these search engines is one thing that is sure to annoy you and pack your inbox full of spam – tons and tons of spam. Most of these ‘search engines’ are not actually search engines at all but lists of suckers who have signed up to submit their sites to these ostensible ‘search engines’, and in exchange for being listed in "suckersearch.com", they have to check a box that lets the spammers at "suckersearch.com" fill their inbox with their incessant and useless newsletters – packed with overpriced affiliate links and offers to spend money. Thank goodness I always use a temporary ‘spam-catcher’ email address for offers like this. I have gone back to check my ‘spam-catcher’ email after signing up for one of these services and noticed that the inbox is overflowing with this garbage and other fantastically annoying and coincidental spam. Spammers have gotten increasingly desperate in their efforts to get people to ‘opt-in’ to receiving all of this unwanted correspondence. It has also not gone unnoticed by these spammers that many people would like to somehow rise in the search engine rankings and doing so is regarded as a kind of black magic by many. Thus, not long ago, one clever spammer got smart and decided to create a mysterious search engine program that would help your site rise in the rankings. The catch is that you must agree to accept all his spam and/or agree to receive a regular newsletter from him. Ingenious. But it does not help your search engine ranking one bit. Who Uses all those Search Engines? The only search engines that people really use can be seen on the master list at TheSearchEngineList.com, mostly Google and Yahoo!. None of them require you to accept frequent mailings of some annoying newsletter. The only search engines that matter are the ones like Google, Yahoo and the major search engines. They do not have young salespeople in call centers bugging you at your office to get listed for a fee. This is just another variety of suckersearch listing. There are some other specialized search engines that people do use, but none of them require that you accept their spam, subscribe to their newsletter or pay for a listing. They just do search. While compiling our listing of legitimate search engines, we ran across a couple of ‘search engines’ that required people to pay to be listed. Some of them seemed to have really captured a good niche… there was one for lawyers… lawyers have budgets for things like advertising and are not generally super-adept at technology, so this particular ‘suckersearch’ seemed to have done pretty well fleecing lawyers – many of whom actually paid to be listed in a directory or "search engine" for lawyers. So Don’t fall for SuckerSearch! Don’t fall for suckersearch. Don’t submit your site to 157 varieties of search engine that nobody uses nor has even heard of. Do not pay to be listed in a directory of suckers who thought that by paying some company they had never before heard of, they would get a number one ranking in Google and customers would be lined up on the sidewalk in front of their business. When you see a site offering to list your site in 100 or more search engines for some small fee or even for free… well, don’t even waste the click – not even if they pay you. Hit the back button and go to a site which can actually help. You know what you need to do. It looks a bit like work. Optimize your site for keywords. Get backlinks. Even if you have to buy them. If you are ambitious, write articles with links to your site and distribute them. Google will automatically do a reverse telephone number lookup. All you need to do is enter the telephone number (landline) that you would like to identify and it will return the name of the owner. There are a number of other sites which also do this for free. It is amazing to see advertisements online advertising reverse phone directory lookup searches for $35.00 when you can get it from Google, 411.com and other sources for free! See Right Into Anyone’s Backyard. The first time you see this, it is truly amazing. You can enter virtually any address inside the USA, and see a bird’s eye view image of that address. All you do, is enter the address, then click on the link marked "Bird’s Eye View". You can zoom in and see right into your old neighborhood, revisit your old school, or see any address in the USA. Webcams have become quite popular with many people installing them to watch over their homes or businesses. Unfortunately for many of these folks, their configuration skills are not top-notch and they install their webcams with default settings. This makes their webcam visible to anyone on the web who knows how to find them. You can actually find these cameras and control them yourself. Most surprising of all is that some people have even unwittingly installed cameras like this in their bedrooms – perhaps intending to catch a cheating spouse, but unwittingly broadcasting it all to the world. Google has created a unique tool to suggest keywords as you type. It is a very neat interface and is quite addicting if you are trying to come up with useful keywords. What did they call it? Google Suggest of course! Another brilliant idea from the folks at the Googleplex. Search Engines which do translation (Google, Altavista…), also Search Engine Caches. You simply set the Search Engine to translate a page. Set it to translate from some unusual language to English and visit the page you want to see through the search engine… which is now acting as a proxy. You can check this by visiting any IP checking webpage. Google acts as a transparent proxy, but other search engines handle things differently. Translation sites may also do this. You can also use the Google Cache to read banned sites. This is useful for recruiters and especially small business owners who do not want to pay hefty headhunter fees or what the big search companies charge for database access. There are ways to do it with Boolean scripts or you may simply try the various methods at a site like CV Fox. You can find out who owns a particular IP address. This can be useful if you get an email that you would like to identify the sender of, or for any other reason you might need to look up an IP. You can find out the IP Address of a domain – then see if that domain has a webcam online. You can enter tracking numbers for UPS, FedEx, and USPS into Google. This avoids going through the log in and hassle of the individual shipping company site. Just enter the airline and flight to track it. Finding the Time or Weather in a faraway location.